Featuring: Elizabeth Taylor, Rock Hudson, James Dean. Director: George Stevens. You can't really go wrong with a cast like Elizabeth Taylor, Rock Hudson and James Dean. Each of them were legends in their own right. I also believe that Hudson and Dean gave the best performances of their careers in this movie (Hate to admit it, but I think Rebel Without a Cause is a bit overrated). Hudson was wonderful as a wealthy, traditional Texas rancher who falls for the strong-willed (surprise, surprise) Elizabeth Taylor the moment they met. This is really a tale of their marriage over the years, and the dysfunctional family the two of them produced. The charisma between Hudson and Taylor is absolutely fantastic and some of the most memorable scenes are the two of them in bed arguing like an old married couple. It's hard to pull off those simpler moments in life and make them relateable and the two of them are very convincing. James Dean plays Hudson's rival who has a huge chip on his shoulder and uses that motivation to work his way from the bottom to build his own empire. He creates a complex, if troubled character and portrays a man with an inferiority complex wonderfully. Overall, this is a fantastic epic well worth the over three hour run-time. You will witness some of the greatest actors of all time doing what they do best, creating characters that are believable, like us yet different and very compelling. You should definitely check this one out. Why is it in your queue? I'm in love with Elizabeth Taylor, and not in some creepy necrophilia kind of way either you sicko. What stood out the most to you? The chemistry Taylor and Hudson had as an old married couple could be really funny at times. What mood should I be in to watch this movie? In the mood to watch a good movie with humor, intrigue and interesting characters. Also, you should have about three and a half hours because it's pretty long. 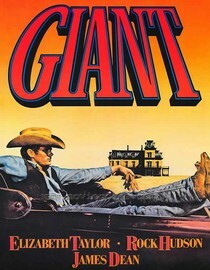 I enjoyed this special and have a greater appreciation of the movie "Giant." Ferber and George Stevens were "something else".